This villa manages to be luxurious and family friendly at the same time. Four bedrooms plus a bungalow make the space a great retreat for a family reunion. It’s easy to keep an eye on any kids wandering to the beach, and everything is within walking distance! Villa BOM is one of St. Barts most stunning villas and one of the rare properties on a beach. 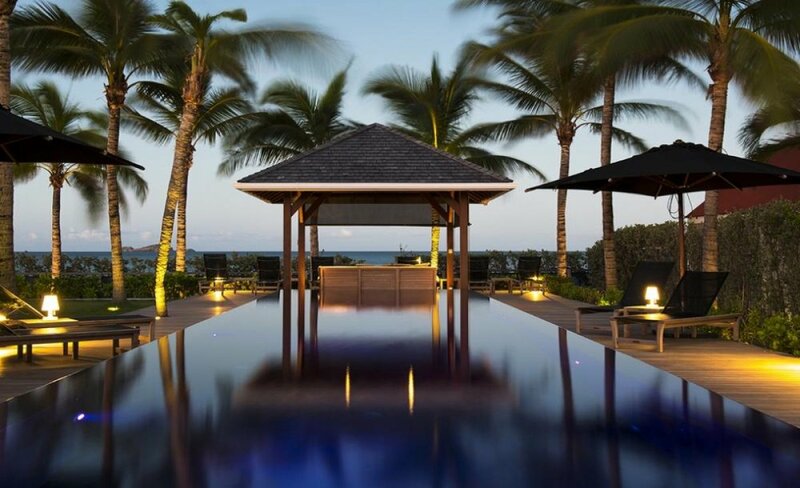 Designed by architect François Pécard, this luxurious property is located on St Jean beach, just a short walk away from some of the finest restaurants on the island, as well as numerous water sports activities, the airport, supermarkets, and pharmacy. The great room is composed of a vast contemporary living room, dining room and a fully equipped gourmet kitchen. Beautifully decorated with white fabrics and contrasting dark wood furniture with exotic wedge wood floors, this fully air-conditioned living area opens to a covered patio where an outside dining area overlooks the deck and pool. The black lava-tiled pool emerges from the wood deck and overflows on all four sides. Guests relaxing under the pergola can choose between taking a dip in the heated pool or plunging into the waves of St Jean bay. It is the ideal location for family vacations where parents can keep an attentive eye on the toddlers having fun on the beach. Four bedrooms are in the main house, along with the living and dining rooms, shaded outdoor dining area and gourmet kitchen. All of the bedrooms are generous in size and have sea views and luxurious full bathrooms stocked with Ligne St. Barth bath products. Two have four-posted king beds and private terraces, and two are outfitted with twin beds, which can be set up as a king, but there’s not a bad room among them. A fifth bedroom is housed in an independent pavilion with its own bathroom and fully equipped kitchen, making it an attractive option for a nanny or other guests who would like more privacy. An villa representative will meet guests at the airport and guide them to the villa. Guests follow in rental cars. 1 Session of Kundalini Yoga offered per week of stay. Room service available with the Tom Beach Hotel next door. Chef services available upon request. Laundry service available upon request.